The rug is from Dash and Albert. They have lots of great fun ones. I love grey and yellow together, but have never thought of adding mauve. Your design board looks beautiful, I should try it! I love the mirror and light! Thanks for stopping by and your lovely comments, Debbie. Pretty palette! It’s so fresh and Springy without being too overboard. Oh and I’m in love with that yellow chair – sigh! Doesn’t that yellow chair just feel happy! Thanks for visiting Heather! What a pretty, calm feeling to this entry! I am totally in love with the artwork – that piece is just beautiful! 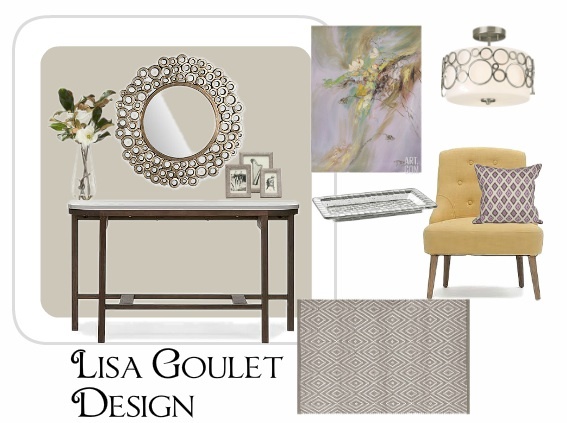 Very nice, Lisa – looking forward to the home office reveal!! Thanks so much Sheila. I’m loving that artwork as well, such a pretty piece for spring!